More Pictures Uploaded! 4/17/2013 | Travis the Warrior --- Kickin' Cancer! We have been so busy that we have fallen behind on our picture uploads. Sorry! We hope you can understand…There are some more new pictures as of yesterday and today. 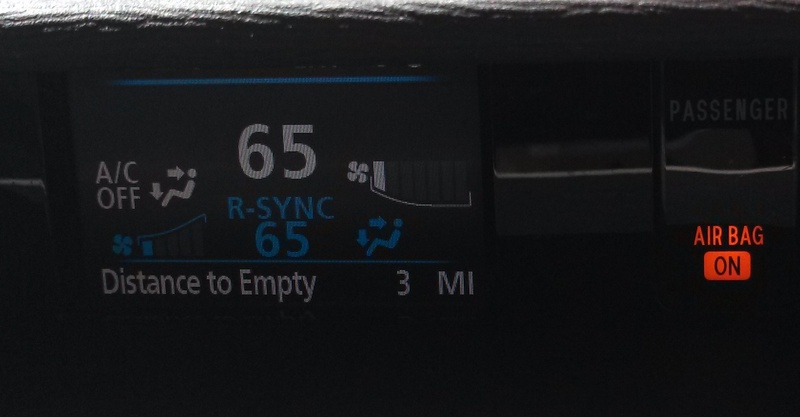 Some have asked about the picture that shows part of our dashboard so I will try to explain. When driving across the deserts of Arizona, New Mexico and Texas, there are many times that there will be signs indicating that there are “No Services” for the next 40, 50 or 60 miles. This is usually a good time to double check your Gas, Food, and Bathroom situations and proceed if all will last that distance. We were driving in Texas between El Paso and San Antonio and found ourselves coasting into the next available gas station with our dashboard reading “Distance to Empty 3 Miles” and the AC Off. Normally we paid attention to these signs very carefully and had plenty of buffer, in all accounts, to make it to the next small town. However, in this case, there was no sign indicating that there would be ~50 miles between towns and we kept expecting to see an exit in the next mile or two. Well, the exit never came in 50 miles and we just barely made it to the gas station with only 3 miles to spare. Someone must have been looking out for us!